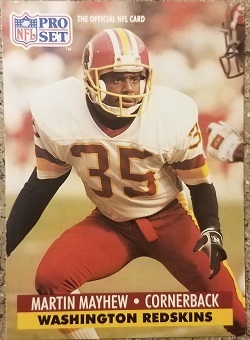 By sharing some of the football cards from my collection, my goal is to put a spotlight on defensive backs who may have become underrated or have been forgotten by history. Martin Mayhew won a Super Bowl and intercepted more than 20 passes and scored a couple of touchdowns in his eight-year NFL career, but his post-playing career has been equally, if not more, impressive. 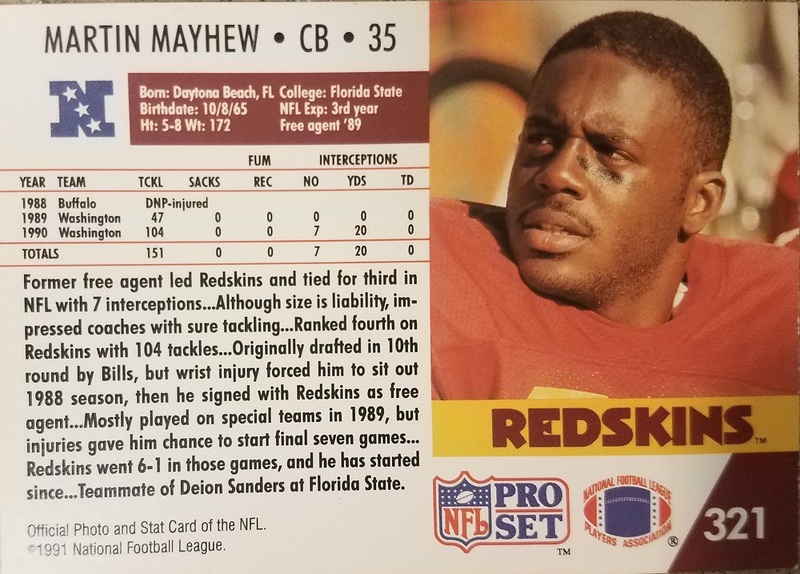 Coming out of Florida State in 1988, where he and Deion Sanders were teammates, Mayhew was a 10th-round draft pick by the Buffalo Bills. As the 262nd overall pick, he wouldn’t have gotten drafted today in the seven-round draft era. A wrist injury cost Mayhew the ’88 season, the Bills cut him, and he didn’t make his pro debut until ’89 with Washington. Mayhew worked his way into a full-time starter by his second season. He played four years with Washington, helping the team win Super Bowl XXVI while starting opposite eventual Hall of Fame corner Darrell Green. Mayhew played another four with the Tampa Bay Buccaneers, retiring after the 1996 season. For his career he intercepted 21 passes (plus two in the playoffs) and returned one for a touchdown. He also forced five fumbles, recovered four fumbles, recorded one sack and 618 tackles. After football, Mayhew went to law school at Georgetown University, earning his J.D. in 2000. He started working for the Detroit Lions in 2001, eventually rising to general manager in 2008. In 2016, he took the Director of Football Operations position with the New York Giants. In 2017, he was hired as Senior Personnel Executive by the San Francisco 49ers, where the 52-year-old works today.